Are you new to blockchain? If want to learn what blockchain is all about and why do you need a blockchain. In this article, you’ll learn the purpose of blockchain and what questions you should be asking yourself before making a decision on blockchain. Blockchain is the technology of the year 2018. You may thank bitcoin, altcoins (cryptocurrency), and ICOs (Initial Coin Offering) for the rise of blockchain. Thousands of blockchains have already been created and available publicly on GitHub and other open source platforms. According to a survey, 58% of large enterprises are thinking of a way to implement blockchain in their projects. But, do they really need a blockchain? In this article, you’ll learn the purpose of blockchain and what questions you should be asking yourself before making a decision on adopting blockchain. The blockchain concept was first introduced by Stuart Haber and W. Scott Stornetta in 1991 as “a cryptographically secured chain of blocks,” which means a chain or blocks that are linked and cryptographically secured. Each block is a combination of three items; a hash pointer to the previous block, a timestamp, and transaction data. By design, blockchains are secure and difficult to modify. Blockchain, by design, requires higher processing power than normal data computing. It is all because of redundancy of data, distributed storage, and cryptography. Data encryption and decryption is a costly affair by nature. Today, computers have more processing power thanks to modern processors developed by NVIDIA. Blockchain is seen as a shield against cybercrime. Cybercrime has grown multifold in the past few years. The hacking of over a billion Yahoo accounts, the Equifax data breach, and increased ransomware damages are just a few incidents. As a matter of fact, over one million cyber threats are released every day and by 2020, over 200 billion IoT devices will need security. Today, Cyber Security is one of the biggest challenges for CEOs. Blockchain brings trust to a transactional system. So, my first question to you is, is your system (current or new) missing the trust factor? Do you need to prove to your customers that the transactions are verified and validated by unbiased third-parties? Blockchain is a technology to create and maintain a cryptographically secure, shared, and distributed ledger (a database) for transactions. Blockchain brings trust, accountability, and transparency to digital transactions. All transactions that exist on a blockchain are shared and distributed among a network of peer-to-peer computers. Transactions are encrypted before they are stored and shared. Let’s remove the security part from the list. I bet most of the enterprise systems do not want to be public, transparent, or distributed. Also, a system built on blockchain does not only take a longer time to process transactions, but also requires many more times the resources, such as processing, electricity, and data transfer. If that is the case, you don’t really need blockchain. Here are some of the questions you need to answer. Is your system a database/transaction based system? Are speed and performance a major need of your system? Does your system need to be transparent and public? Are you OK to distribute your data to millions on public and shared computers? Does your system need approval from a crowd? Of course, security is a major need of today’s systems, but does your current technology not provide all security options? Are you OK to make your project open source and public? Ask these questions. The following decision diagram will help you navigate through your questions and lead you to your answer. Blockchain technology fundamentally has a problem and it’s not for everyone. Saving redundant data on thousands of computers, getting approval from them, encrypting is a lot of work. Blockchain is not for everyone. 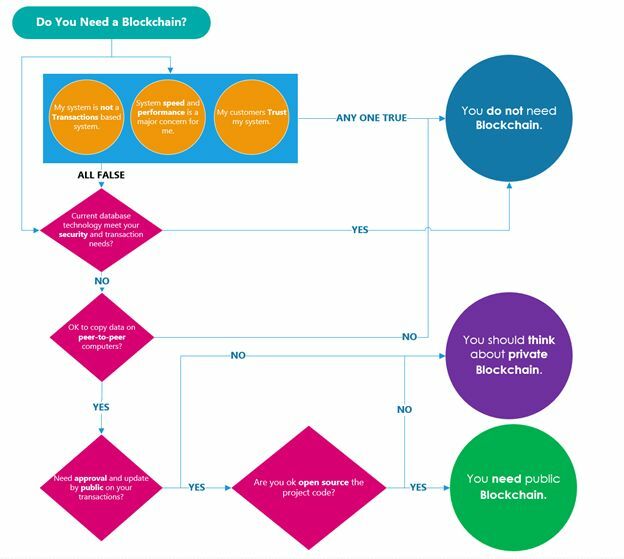 Here are some of the key points to consider when deciding to build a blockchain. As we’ve seen in our earlier definition, blockchain is not easy to implement and some of the concepts are still new and evolving. Data is redundant on thousands of distributed computers and all these computers must agree and validate. All users on a blockchain are public but anonymous, and can be anywhere in the world. It’s not something where you can pick up a phone and make a call. Blockchain technology isn’t easy to understand by non-technical people and requires an expert level of understanding of technology. Not all systems need to be public and transparent. A blockchain based system requires approval from all participating nodes. While the blockchain process is public and transparent, it could easily lead to some disagreement among participating parties and delay the processing. Performance is a major concern in a blockchain transaction. Each transaction is distributed and peer-to-peer and requires all involved parties to validate and approve the changes. Not only does the process lead to a transaction performance but the time of completion is high. Distributing data and cryptographical operations are time- and resource-consuming and lead to higher transaction costs. Blockchain transactions require a special kind of hardware and have a high demand for electricity. Normal computers aren’t sufficient to participate as blockchain nodes. You will need to spend thousands of dollars on new computers that can support blockchain transaction processing. Public blockchain software is open source and usually available in Github to download and contribute to the public. Next > How Do I Become A Blockchain Developer?